"SMTP" redirects here. For the email delivery company, see SMTP (company). Various forms of one-to-one electronic messaging were used in the 1960s. Users communicated using systems developed for specific mainframe computers. As more computers were interconnected, especially in the U.S. Government's ARPANET, standards were developed to permit exchange of messages between different operating systems. SMTP grew out of these standards developed during the 1970s. SMTP traces its roots to two implementations described in 1971: the Mail Box Protocol, whose implementation has been disputed, but is discussed in RFC 196 and other RFCs, and the SNDMSG program, which, according to RFC 2235, Ray Tomlinson of BBN invented for TENEX computers to send mail messages across the ARPANET. Fewer than 50 hosts were connected to the ARPANET at this time. Further implementations include FTP Mail and Mail Protocol, both from 1973. Development work continued throughout the 1970s, until the ARPANET transitioned into the modern Internet around 1980. Jon Postel then proposed a Mail Transfer Protocol in 1980 that began to remove the mail's reliance on FTP. SMTP was published as RFC 788 in November 1981, also by Postel. SMTP became widely used in the early 1980s. At the time, it was a complement to Unix to Unix Copy Program (UUCP) mail, which was better suited for handling email transfers between machines that were intermittently connected. SMTP, on the other hand, works best when both the sending and receiving machines are connected to the network all the time. Both use a store and forward mechanism and are examples of push technology. Though Usenet's newsgroups are still propagated with UUCP between servers, UUCP as a mail transport has virtually disappeared along with the "bang paths" it used as message routing headers. Sendmail, released with 4.1cBSD, right after RFC 788, was one of the first mail transfer agents to implement SMTP. Over time, as BSD Unix became the most popular operating system on the Internet, Sendmail became the most common MTA (mail transfer agent). Some other popular SMTP server programs include[chronology citation needed] Postfix, qmail, Novell GroupWise, Exim, Novell NetMail, Microsoft Exchange Server and Oracle Communications Messaging Server. Message submission (RFC 2476) and SMTP-AUTH (RFC 2554) were introduced in 1998 and 1999, both describing new trends in email delivery. Originally, SMTP servers were typically internal to an organization, receiving mail for the organization from the outside, and relaying messages from the organization to the outside. But as time went on, SMTP servers (mail transfer agents), in practice, were expanding their roles to become message submission agents for Mail user agents, some of which were now relaying mail from the outside of an organization. (e.g. a company executive wishes to send email while on a trip using the corporate SMTP server.) This issue, a consequence of the rapid expansion and popularity of the World Wide Web, meant that SMTP had to include specific rules and methods for relaying mail and authenticating users to prevent abuses such as relaying of unsolicited email (spam). Work on message submission (RFC 2476) was originally started because popular mail servers would often rewrite mail in an attempt to fix problems in it, for example, adding a domain name to an unqualified address. This behavior is helpful when the message being fixed is an initial submission, but dangerous and harmful when the message originated elsewhere and is being relayed. Cleanly separating mail into submission and relay was seen as a way to permit and encourage rewriting submissions while prohibiting rewriting relay. As spam became more prevalent, it was also seen as a way to provide authorization for mail being sent out from an organization, as well as traceability. This separation of relay and submission quickly became a foundation for modern email security practices. Blue arrows depict implementation of SMTP variations. Email is submitted by a mail client (mail user agent, MUA) to a mail server (mail submission agent, MSA) using SMTP on TCP port 587. Most mailbox providers still allow submission on traditional port 25. The MSA delivers the mail to its mail transfer agent (mail transfer agent, MTA). Often, these two agents are instances of the same software launched with different options on the same machine. 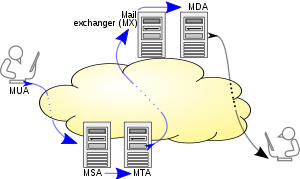 Local processing can be done either on a single machine, or split among multiple machines; mail agent processes on one machine can share files, but if processing is on multiple machines, they transfer messages between each other using SMTP, where each machine is configured to use the next machine as a smart host. Each process is an MTA (an SMTP server) in its own right. The boundary MTA uses the Domain name system (DNS) to look up the mail exchanger record (MX record) for the recipient's domain (the part of the email address on the right of @). The MX record contains the name of the target host. Based on the target host and other factors, the MTA selects an exchange server: see the article MX record. The MTA connects to the exchange server as an SMTP client. Message transfer can occur in a single connection between two MTAs, or in a series of hops through intermediary systems. A receiving SMTP server may be the ultimate destination, an intermediate "relay" (that is, it stores and forwards the message) or a "gateway" (that is, it may forward the message using some protocol other than SMTP). Each hop is a formal handoff of responsibility for the message, whereby the receiving server must either deliver the message or properly report the failure to do so. MAIL command, to establish the return address, also called return-path, reverse-path, bounce address, mfrom, or envelope sender. RCPT command, to establish a recipient of the message. This command can be issued multiple times, one for each recipient. These addresses are also part of the envelope. DATA to signal the beginning of the message text; the content of the message, as opposed to its envelope. It consists of a message header and a message body separated by an empty line. DATA is actually a group of commands, and the server replies twice: once to the DATA command itself, to acknowledge that it is ready to receive the text, and the second time after the end-of-data sequence, to either accept or reject the entire message. Besides the intermediate reply for DATA, each server's reply can be either positive (2xx reply codes) or negative. Negative replies can be permanent (5xx codes) or transient (4xx codes). A reject is a permanent failure and the client should send a bounce message to the server it received it from. A drop is a positive response followed by message discard rather than delivery. The initiating host, the SMTP client, can be either an end-user's email client, functionally identified as a mail user agent (MUA), or a relay server's mail transfer agent (MTA), that is an SMTP server acting as an SMTP client, in the relevant session, in order to relay mail. Fully capable SMTP servers maintain queues of messages for retrying message transmissions that resulted in transient failures. A MUA knows the outgoing mail SMTP server from its configuration. A relay server typically determines which server to connect to by looking up the MX (Mail eXchange) DNS resource record for each recipient's domain name. If no MX record is found, a conformant relaying server (not all are) instead looks up the A record. Relay servers can also be configured to use a smart host. A relay server initiates a TCP connection to the server on the "well-known port" for SMTP: port 25, or for connecting to an MSA, port 587. The main difference between an MTA and an MSA is that connecting to an MSA requires SMTP Authentication. SMTP is a delivery protocol only. In normal use, mail is "pushed" to a destination mail server (or next-hop mail server) as it arrives. Mail is routed based on the destination server, not the individual user(s) to which it is addressed. Other protocols, such as the Post Office Protocol (POP) and the Internet Message Access Protocol (IMAP) are specifically designed for use by individual users retrieving messages and managing mail boxes. To permit an intermittently-connected mail server to pull messages from a remote server on demand, SMTP has a feature to initiate mail queue processing on a remote server (see Remote Message Queue Starting below). POP and IMAP are unsuitable protocols for relaying mail by intermittently-connected machines; they are designed to operate after final delivery, when information critical to the correct operation of mail relay (the "mail envelope") has been removed. Remote Message Queue Starting is a feature of SMTP that permits a remote host to start processing of the mail queue on a server so it may receive messages destined to it by sending the TURN command. This feature however was deemed insecure and was extended in RFC 1985 with the ETRN command which operates more securely using an authentication method based on Domain Name System information. An email client needs to know the IP address of its initial SMTP server and this has to be given as part of its configuration (usually given as a DNS name). This server will deliver outgoing messages on behalf of the user. In the past, many systems imposed usage restrictions by the location of the client, only permitting usage by clients whose IP address is one that the server administrators control. Usage from any other client IP address is disallowed. Modern SMTP servers typically offer an alternative system that requires authentication of clients by credentials before allowing access. Under this system, an ISP's SMTP server will not allow access by users who are outside the ISP's network. More precisely, the server may only allow access to users with an IP address provided by the ISP, which is equivalent to requiring that they are connected to the Internet using that same ISP. A mobile user may often be on a network other than that of their normal ISP, and will then find that sending email fails because the configured SMTP server choice is no longer accessible. This system has several variations. For example, an organisation's SMTP server may only provide service to users on the same network, enforcing this by firewalling to block access by users on the wider Internet. Or the server may perform range checks on the client's IP address. These methods were typically used by corporations and institutions such as universities which provided an SMTP server for outbound mail only for use internally within the organisation. However, most of these bodies now use client authentication methods, as described below. Where a user is mobile, and may use different ISPs to connect to the internet, this kind of usage restriction is onerous, and altering the configured outbound email SMTP server address is impractical. It is highly desirable to be able to use email client configuration information that does not need to change. Modern SMTP servers typically require authentication of clients by credentials before allowing access, rather than restricting access by location as described earlier. This more flexible system is friendly to mobile users and allows them to have a fixed choice of configured outbound SMTP server. SMTP Authentication, often abbreviated SMTP AUTH, is an extension of the SMTP in order to log in using an authentication mechanism. A server that is accessible on the wider Internet and does not enforce these kinds of access restrictions is known as an open relay. This is now generally considered a bad practice worthy of blacklisting. Communication between mail servers generally uses the standard TCP port 25 designated for SMTP. 465 This port was deprecated after RFC 2487, until the issue of RFC 8314. Port 2525 and others may be used by some individual providers, but have never been officially supported. Most Internet service providers now block all outgoing port 25 traffic from their customers as an anti-spam measure. For the same reason, businesses will typically configure their firewall to only allow outgoing port 25 traffic from their designated mail servers. The client notifies the receiver of the originating email address of the message in a MAIL FROM command. This is also the return or bounce address in case the message cannot be delivered. In this example the email message is sent to two mailboxes on the same SMTP server: one for each recipient listed in the To and Cc header fields. The corresponding SMTP command is RCPT TO. Each successful reception and execution of a command is acknowledged by the server with a result code and response message (e.g., 250 Ok). The transmission of the body of the mail message is initiated with a DATA command after which it is transmitted verbatim line by line and is terminated with an end-of-data sequence. This sequence consists of a new-line (<CR><LF>), a single full stop (period), followed by another new-line. Since a message body can contain a line with just a period as part of the text, the client sends two periods every time a line starts with a period; correspondingly, the server replaces every sequence of two periods at the beginning of a line with a single one. Such escaping method is called dot-stuffing. The server's positive reply to the end-of-data, as exemplified, implies that the server has taken the responsibility of delivering the message. A message can be doubled if there is a communication failure at this time, e.g. due to a power shortage: Until the sender has received that 250 reply, it must assume the message was not delivered. On the other hand, after the receiver has decided to accept the message, it must assume the message has been delivered to it. Thus, during this time span, both agents have active copies of the message that they will try to deliver. The probability that a communication failure occurs exactly at this step is directly proportional to the amount of filtering that the server performs on the message body, most often for anti-spam purposes. The limiting timeout is specified to be 10 minutes. The QUIT command ends the session. If the email has other recipients located elsewhere, the client would QUIT and connect to an appropriate SMTP server for subsequent recipients after the current destination(s) had been queued. The information that the client sends in the HELO and MAIL FROM commands are added (not seen in example code) as additional header fields to the message by the receiving server. It adds a Received and Return-Path header field, respectively. Some clients are implemented to close the connection after the message is accepted (250 Ok: queued as 12345), so the last two lines may actually be omitted. This causes an error on the server when trying to send the 221 reply. The original SMTP protocol supported only unauthenticated plaintext communications susceptible to Man in the Middle attacks, spoofing, and spamming. A number of optional extensions specify various mechanisms to address these problems. Clients learn a server's supported options by using the EHLO greeting, as exemplified below, instead of the original HELO (example above). Clients fall back to HELO only if the server does not support SMTP extensions. Modern clients may use the ESMTP extension keyword SIZE to query the server for the maximum message size that will be accepted. Older clients and servers may try to transfer excessively sized messages that will be rejected after consuming network resources, including connect time to network links that is paid by the minute. Thus smtp2.example.com declares that can accept a fixed maximum message size no larger than 14,680,064 octets (8-bit bytes). In the simplest case, an ESMTP server declares a maximum SIZE immediately after receiving an EHLO. According to RFC 1870, however, the numeric parameter to the SIZE extension in the EHLO response is optional. Clients may instead, when issuing a MAIL FROM command, include a numeric estimate of the size of the message they are transferring, so that the server can refuse receipt of overly-large messages. On-Demand Mail Relay (ODMR) is an SMTP extension standardized in RFC 2645 that allows an intermittently-connected SMTP server to receive email queued for it when it is connected. Users whose native script is not Latin based, or who use diacritic not in the ASCII character set have had difficulty with the Latin email address requirement. RFC 6531 was created to solve that problem, providing internationalization features for SMTP, the SMTPUTF8 extension and support for multi-byte and non-ASCII characters in email addresses, such as those with diacritics and other language characters such as Greek and Chinese. Current support is limited, but there is strong interest in broad adoption of RFC 6531 and the related RFCs in countries like China that have a large user base where Latin (ASCII) is a foreign script. Mail delivery can occur both over plain text and encrypted connections, however the communicating parties might not know in advance of other party's ability to use secure channel. SMTP Authentication, often abbreviated SMTP AUTH, describes a mechanism for a client to log in using any authentication mechanism supported by the server. It is mainly used by submission servers, where authentication is mandatory. Multiple RFCs exist that provide different variations of the mechanism and update each other. RFC 3207 "SMTP Service Extension for Secure SMTP over Transport Layer Security" extension describes STARTTLS command that enables server to tell client that it supports encrypted communications and client to request an upgrade to a secure channel. STARTTLS is effective only against passive observation attacks, since the STARTTLS negotiation happens in plain text and an active attacker can trivially remove STARTTLS command (client would think that server did not send STARTTLS header so does not support STARTTLS, while server would think that client did not respond to STARTTLS header and thus does not support STARTTLS). Note that STARTTLS is also defined for IMAP and POP3 in other RFCs, but these protocols serve different purposes: SMTP is used for communication between message transfer agents, while IMAP and POP3 are for end clients and message transfer agents. Electronic Frontier Foundation maintains a "STARTTLS Everywhere" list that similarly to "HTTPS Everywhere" list allows relying parties to discover others supporting secure communication without prior communication. A newer 2018 RFC 8461called "SMTP MTA Strict Transport Security (MTA-STS)" aims to addresses the problem of active adversary by defining a protocol for mail servers to declare their ability to use secure channels in specific files on the sever and specific DNS TXT records. The relying party would regularly check existence of such record, and cache it for the amount of time specified in the record and never communicate over insecure channels until record expires. Note that MTA-STS records apply only to SMTP traffic (between mail servers) while communications between end client and the mail server are protected by and HTTP Strict Transport Security (for HTTPS). In April 2019 Google Mail announced support for MTA-STS. A number of protocols allows secure delivery of messages, but they can fail due to misconfigurations or deliberate active interference, leading to undelivered messages or delivery over unencrypted or unauthenticated channels. RFC 8460 "SMTP TLS Reporting" describes a reporting mechanism and format for sharing statistics and specific information about potential failures with recipient domains. Recipient domains can then use this information to both detect potential attacks and diagnose unintentional misconfigurations. In April 2019 Google Mail announced support for SMTP TLS Reporting. The original design of SMTP had no facility to authenticate senders, or check that servers were authorized to send on their behalf, with the result that email spoofing is possible, and commonly used in email spam and phishing. Occasional proposals are made to modify SMTP extensively or replace it completely. One example of this is Internet Mail 2000, but neither it, nor any other has made much headway in the face of the network effect of the huge installed base of classic SMTP. Instead, mail servers now use a range of techniques, including DomainKeys Identified Mail, Sender Policy Framework and DMARC, DNSBLs and greylisting to reject or quarantine suspicious emails. ^ The article about sender rewriting contains technical background info about the early SMTP history and source routing before RFC 1123. ^ John Klensin (October 2008). "Basic Structure". Simple Mail Transfer Protocol. IETF. sec. 2.1. doi:10.17487/RFC5321. RFC 5321. Retrieved January 16, 2016. ^ Cara Garretson (2005). "ISPs Pitch In to Stop Spam". PC World. Retrieved January 18, 2016. Last month, the Anti-Spam Technical Alliance, formed last year by Yahoo, America Online, EarthLink, and Microsoft, issued a list of antispam recommendations that includes filtering Port 25. ^ John Klensin; Ned Freed; Marshall T. Rose; Einar A. Stefferud; Dave Crocker (November 1995). SMTP Service Extensions. IETF. doi:10.17487/RFC1869. RFC 1869. ^ "MAIL Parameters". IANA. Retrieved April 3, 2016. ^ Jiankang Yao (December 19, 2014). "Chinese email address". EAI (Mailing list). IETF. Retrieved May 24, 2016. ^ a b "Introducing MTA Strict Transport Security (MTA-STS) | Hardenize Blog". www.hardenize.com. Retrieved April 25, 2019. ^ a b Cimpanu, Catalin. "Gmail becomes first major email provider to support MTA-STS and TLS Reporting". ZDNet. Retrieved April 25, 2019. Hughes, L (1998). Internet E-mail: Protocols, Standards and Implementation. Artech House Publishers. ISBN 978-0-89006-939-4. Hunt, C (2003). sendmail Cookbook. O'Reilly Media. ISBN 978-0-596-00471-2. Johnson, K (2000). Internet Email Protocols: A Developer's Guide. Addison-Wesley Professional. ISBN 978-0-201-43288-6. Loshin, P (1999). Essential Email Standards: RFCs and Protocols Made Practical. John Wiley & Sons. ISBN 978-0-471-34597-8. Wood, D (1999). Programming Internet Mail. O'Reilly. ISBN 978-1-56592-479-6.